The Oscars are finally here! I have been looking forward to these awards since last year’s Envelope-gate, and can’t wait to see the surprises and snubs of the night. After a successful hosting stint, Jimmy Kimmel is back to deliver quick jokes and hopefully roast some celebrities! Although the comedy of the night is always fun, the most intriguing part of the night is finding out who actually won an Academy Award! After months and months of speculation, March 4th is here, and what are the Oscars without my prediction? Last year, I did okay with my predictions for the 2017 Oscars, but this year I’m determined to do even better! I will go through each major category and explain who I think should win and who will win. Here are my very unauthorized, somewhat informed 90th Academy Award predictions! Should Win: Lady Bird, the most critically-revered movie of the year, deserves Best Picture. It has the most broad appeal to mass audiences and really is the movie that encapsulates this past year the best. It is shaping up to be the year of women and what better represents that then a movie about generations of women directed by a woman? Originally, I thought Lady Bird would be the Best Picture winner, but in the past few weeks, it has really underperformed at other awards shows and is not seen as much of a contender as it was in the beginning of the season. Will Win: Although I would like Lady Bird to win, I will not be upset when Three Billboards Outside Ebbing, Missouri wins. Although Three Billboards has experienced a bit of backlash, I still think it will win Best Picture. It has all the makings of a Best Picture winner with witty writing and powerful performances by everyone in the cast. Although the director Martin McDonagh did not receive a Best Director nomination (normally a prerequisite for a Best Picture win), but I don’t think that will deter Three Billboards. In 2013, Argo infamously won Best Picture without a directing nod for Ben Affleck. I forsee the same thing happening for Three Billboards this year and I can’t wait. Should Win: While all of directors nominated this year are all very deserving, Greta Gerwig deserves to win Best Director. Gerwig is only one of five women to be nominated for the Best Director Oscar, and only one of them has actually won. What Gerwig has accomplished in Lady Bird is almost extraordinary. She is able to direct every actor in that movie with such nuance so that each character, no matter how small, seems to have a backstory. Although Gerwig won’t likely win this year, she is planning of making several more Sacramento-set films which will eventually win her an Academy Award someday. 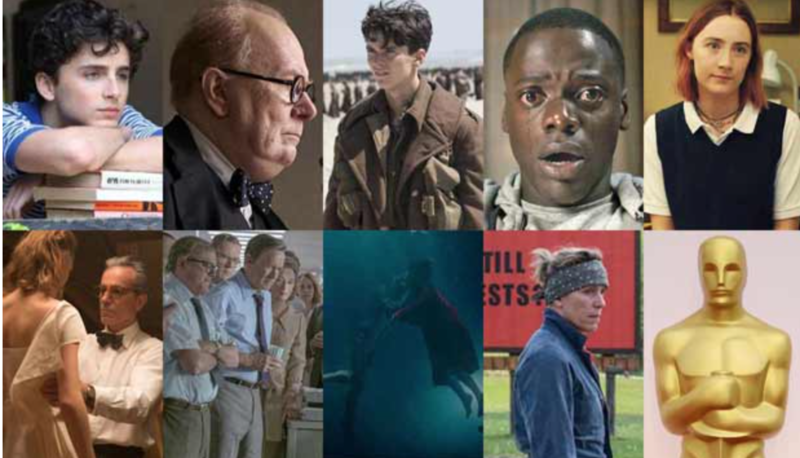 Will Win: To round out the self-described Three Amigos (which also includes Alfonso Cuarón, Alejandro González Iñárritu), Guillermo del Toro will win Best Director. In recent memory, the Best Directing Oscar has seemed to award technical achievement more than the direction of the film as a whole. By those standards, del Toro surpasses all the other nominees. The Shape of Water is a visually flawless film and though difficult to execute, del Toro seems to do it with ease. Although I did not particularly like The Shape of Water, I acknowledge the good work that del Toro did on the film. Should Win: Timothée Chalamet, obviously! His performance is by the best part of Call Me By Your Name and therefore should be rewarded. The way he acts with such subtlety and raw emotion in the film is unlike any performance this year. Chalamet also would be the youngest ever Best Actor winner in the history of the Academy Awards if he were to win. It’s time to take that title away from Adrien Brody! Although Chalamet will most likely not win the Oscar tonight, he’ll definitely win one soon! Will Win: This pains me to write, but unfortunately Gary Oldman will win his first Academy Award. He has won all the necessary awards up to this point and the writing’s on the wall for him to win. What I can also predict is that next year when Oldman is slated to present the Best Actress Oscar, he will “choose not to attend the ceremony”, a la Casey Affleck. Should Win: This is a very difficult “Should Win” for me because I also think that the “Will Win” deserves to win as well. However, I think that Saoirse Ronan should win Best Actress. Her performance in Lady Bird is transcendent and is unlike anything we’ve seen her do before. She truly becomes the feisty Sacramento teen that is Lady Bird and does it with such ease. You really cannot tell that in real life she has a strong Irish brogue! Although it does not seem to be Ronan’s year this time, she’ll win her Oscar soon. Will Win: One of the best actresses of this generation, Frances McDormand, will finally win her second Oscar. She last won for her role in Fargo in 1997. Now twenty-one years later, she will do it all over again. In Three Billboards, McDormand truly becomes her character. When she goes toe-to-toe with Sam Rockwell and Woody Harrelson, you truly believe it. McDormand is one of those actors who can truly do anything and it’s amazing when someone like that can be rewarded. Should Win and Will Win: This is a such an easy one to predict! Sam Rockwell obviously should win for Three Billboards! I have always been a Sam Rockwell fan and thought he was criminally underrated. Now he’s finally been nominated for an Oscar and it couldn’t feel more like his time. His performance in the film outshines all of the other nominees who all pale in comparison. Without spoiling the movie, it is rare for an actor to portray someone so hated then to someone who you can sympathize with. I just can’t wait for Rockwell to win tonight! Should Win: This should have been Laurie Metcalf’s Oscar. She gave the Best Supporting Actress performance of the year and deserves to be rewarded. Her role in Lady Bird demands such nuance and she should be rewarded for that. I think in years to come, people will look back on the 90th Academy Awards and think that Metcalf should’ve won. Will Win: It’s Allison Janney’s to lose at this point. While I like Janney, I do not like her performance in I, Tonya. It is not very difficult and is truly just a variation of what she has done before. I think Janney deserves to win an Oscar, just not for this role. Well, there you have it! Here are my final predictions for the 90th Academy Awards. Watch the show tonight and see if I’m right! And fully expect a follow-up article from me titled “JUSTICE FOR TIMOTHÉE CHALAMET” in the near future. Happy Oscars!